Dimensions: 8-3/8 x 9-1/2 in. 48 pages. Includes 10 sticker sheets. Fo ages 3-8. 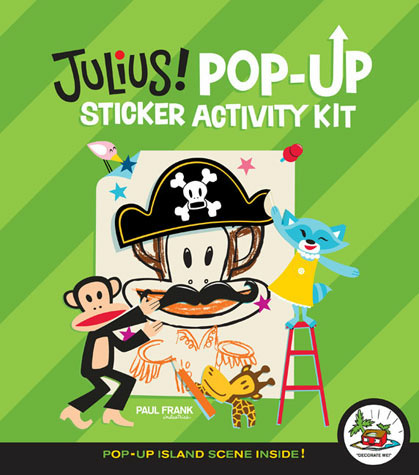 This one-of-a-kind sticker activity kit offers children hours of creative fun with Julius and his friends. The sturdy, portable format features hundreds of stickers, an art-and-sticker activity book, and a pop-up island scene that children can decorate with stickers and punch-out characters. The engaging activities in the 48-page book can be done alone or shared with family and friends. Design Julius's costume, decorate a giant cupcake, create an amusement park scene, and more!